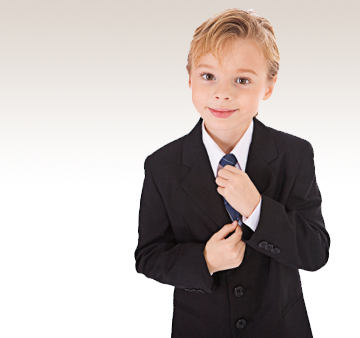 We offer Manners for Young Men, for grades two and up, so that young men gain poise and confidence and are able to handle all social situations with ease. Topics include: introductions, conversations, telephone manners, thank-you notes, grooming, going places/doing things, sportsmanship, dining and table manners. In addition, students join the instructor for a multi-course "Manners in Motion" dinner at a prominent area restaurant. So that students know how to act and what to say in all social situations, we begin with the art of conversation, introductions and telephone manners. Writing thank you notes, being a gracious host and guest are also important traits in a gentleman. Manners for going to a museum, the theater, symphony and a sporting event are also included. Looking your best begins with posture and confidence. We also introduce the young men to basic principles of being well dressed. During this class we include an activity to assist the students with learning to tie a tie. Proper table settings as well as appropriate table manners are covered and practiced in classroom activities. At the conclusion of this program, students dine at a prominent local restaurant where they will enjoy a multi-course dinner and put all their newly learned manners into motion.